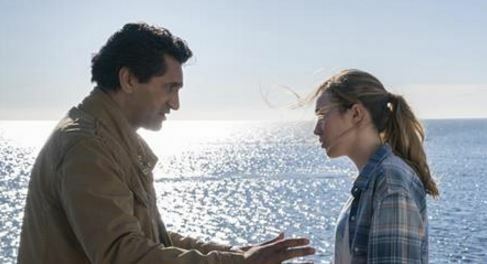 FTWD is back and it looks as if Los Angeles is on fire, and Strand’s yacht is the safe harbor. Strand is still a mystery, and the yacht might not be that safe after all, says Special Contributor Tracey M. in her latest recap. Read on to see if this was a successful return. – David F.
I’m happy to report Travis has grown a pair since season one. Shooting Liza to keep her from turning has given him strength he didn’t know he had. And believe me, he’s going to need it. Nick helps Strand stock Abigail for their voyage, while Travis, Maddie and the rest wait on shore for Nick to return with the dingy. A horde of walkers stumble down the hill toward the shore, and Maddie and Travis bash some skulls before jumping on board with Nick. Chris refuses to leave his mother’s body behind, so she’s loaded on board, too. A walker pops up at the rear of the boat, and Nick gives him a nice propeller-facial as the boat gains momentum. Ophelia nurses her gunshot wound absent mindedly. Something has broken in her. She’s just a shadow now. The next morning, Travis finds Chris sitting alone with Liza’s body. No one has slept and nerves are frayed. Not Nick’s though. He seems right at home. The yacht passes a crowded boat of survivors begging for help. Maddie asks Strand to stop and help them, but he makes it clear that if he stops the boat, it will be to drop someone off, not pick them up. I’m liking Strand. Good guy or bad guy, he’s quick with the quips. If only we knew more about him…all in good time, I suppose. Speaking of Liza, Travis has had enough of Chris moping by his mother’s corpse, and organizes a memorial and burial at sea. Maybe it will bring Chris some closure. They gather at the rear of the boat, and in turn, speak their piece about Liza. Chris walks up to where she lies in repose and angrily flips the table, sending Liza’s body flying into the ocean. Ooookay, Chris, please don’t become a problem. Your blabbermouth sister has already said too much to her radio pal. Travis follows Chris back to his room to try talking him through his grief, but all Chris gives him is one hell of a shiner. He’s so angry that his father shot his mother. Understandable. The group, minus Chris, sits down for a meal. They eat, drink and even laugh a little, as you do after a funeral. Radio-boy has Alicia right where he wants her. They’ve even exchanged names. Alicia begs Strand to help Jack, his fishing boat is sinking. Strand is ticked off. She knows his name?! Nick follows Strand back to the helm. Nick stands up for his sister, but he knows what’s at stake. Nick and Strand talk like old friends, until Strand calls him Nicholas. We have yet to learn why that name gets under his skin. His father named him, but that’s all we know. Meanwhile, Jack radios Alicia saying he’ll see her soon. What?! So that’s why he kept her talking for so long. He’s tracked their location! Chris heads to the back of the boat and jumps off. Nick jumps in after him asking, “What the Hell, man? !” Ya’ gotta love Nick. After pulling Chris back toward the boat, he dives deeper, and explores the ocean. Maddie and Daniel notice there are walkers in the water. Does that make them floaters? Anyway, Maddie and Daniel call for the guys to hurry back to the boat. Chris hightails it back, but Nick decides to investigate a nearby shipwreck, almost getting his face eaten. Back at the surface, he sees bodies and debris everywhere. He ends his swim, just as Strand is alerted that a boat is headed their way quickly, and it’s probably the boat responsible for the shipwreck. Time to move, and quickly. Thanks Alicia, thanks a lot. Our characters are becoming more dimensional in season two. I’ve seen a welcome change in Travis and Alicia’s emotions seem authentic; she’s becoming real. Maddie, Daniel, and Nick remain strong. And Strand, well, he’s just Strand. I’m looking forward to finding out more of his story!